Don't forget Argus Security: Protection Guaranteed. In Argus, the Runner can take a Traffic Accident on every steal, or take one later. An easy punish for tag floaters against Argus, and also a nice way to weather down a Plascrete. I disagree that it must be combined with Midseasons. An interesting and thematic card that begs to be used, but when presented with the daunting task of applying 2 tags, raises doubt in its viability. Runners tend to be in two states when it comes to tags - loaded with tons, or none at all. With the many ways NBN has to tag outside Midseasons, even those methods might stick maybe 1 tag into the next turn against a wary Runner. So, what does apply two tags? Breaking News. If you can find a way to a score it with clicks left, it instantly turns Traffic Accident on. Sneaky Breaking News plays like this usually aim to trash a valuable Resource, so sometimes that trumps dealing at least 2 meat damage. Finding a way to have 2+ clicks after scoring a Breaking News for consecutive Traffic Accidents enters jank territory. Account Siphon punishment. I would rather have Closed Accounts (one influence) and not rely on hitting valuable cards. Midseason Replacements. At this point, isn't committing to Scorched Earth the better option? This card is a mystery to use effectively and reliably, and I challenge Corps to find a way. I do not foresee this card being a big player in the flatline game. 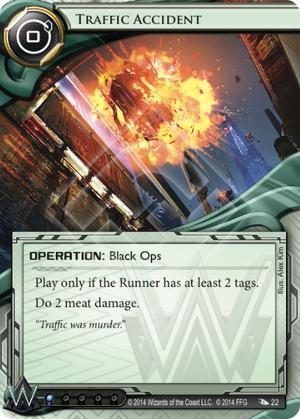 Traffic Accident is a consistent card with a variety of uses beyond being an additional meat damage card. The two tag requirement on Traffic Accident can appear difficult to achieve, but paired with a full tagging suite will usually be achievable. Midseason Replacements is the most obvious choice, it gets the runner to forfeit the tag battle often, but many other cards encourage the runner to play tagged. Argus Security: Protection Guaranteed is most notable as an identity, where in competition the runner may feel that in light of many other plentiful and likely inevitable tagging options like Midseason Replacements, Data Raven and Posted Bounty they can simply submit to the tags, blanking several of these cards. Data Raven became much more consistent in Order and Chaos as Wormhole and Orion give a way to get counters on it without runner options. You will likely need to tailor your tagging options to accommodate Traffic Accident, but the returns are well worth it. Much more than just another card to help push you past lethal in combination with Scorched Earth, overcoming hand sizes and Plascrete Carapace, Traffic Accident can avoid runner defenses and create new opportunities for the corp. Along with Traffic Accident, in Order and Chaos, the runners got access to I've Had Worse; a card defending against meat damage in a new way. Traffic Accident can help push runner hand sizes into Scorched Earth range with a lower chance of triggering I've Had Worse. Even if you do stumble upon the runners cunning event, you have not yet committed your most powerful killing asset to the archives, you the corp could have had worse, you live to scorch another day. Being another card, and so somewhat disposable, also allows the use of Traffic Accident to help create scoring opportunities when the runner is tagged. Putting the runner low on resources, killing tutors or their pupils, encouraging draw actions to reduce the risk of traps are all things Traffic Accident can do if tempo demands it. Traffic Accident also has a generously low influence of 1. This could make it an option in some combined damage kill tactics in other factions. However this reviewer feels this is only something to keep an eye out for in the future. Several of these concepts are illustrated in this deck: Car Full of Nukes. Traffic Accident isn't a card for every flatline deck. It takes special consideration in deck building in more ways than its companion Scorched Earth. However it brings enough support and standalone utility that it can really shine. And here we are with traffic jam, a terrific Weyland card that will never see play in Weyland. This right here is your replacement card for scorched earth in Midseason NBN decks. The extra 9 influence will be greatly appreciated I'm sure. Otherwise this card seems kinda homeless, seeing as that most runners won't allow themselves to accrue 2 tags naturally unless they are desperate enough to account siphon on their forth click. The zero cost for this operation is great and while more than likely you are not going to flatline with traffic accident the potential is there. Must be comboed with mid-season replacements or the tag cost is too unreliable, but otherwise a solid card.